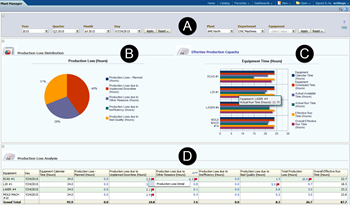 This dashboard outputs information about production loss distribution (B), effective production capacity (C) and production loss (D) for machines in a department of a plant within a selected period. Below the top area (A) that allows this selection on the left side distribution of downtimes on a percentage basis is shown. This may include production loss due to planned hours, unplanned downtime, other reasons, inefficiency or bad quality. The graph on the right side contains data about equipment calendar time, equipment scheduled time, actual available time, actual run time, effective run time and overall effective run time. The table at the bottom outputs results for the above items per machine in hours. Clicking on one of these results opens a production loss detail report which enables to drill down on detailed reasons for the downtime. The production loss detail report contains all particulars for the selected machines and period (A). It can be exported in various formats such as PDF, EXCEL, POWERPOINT or a WEB ARCHIVE file (B).